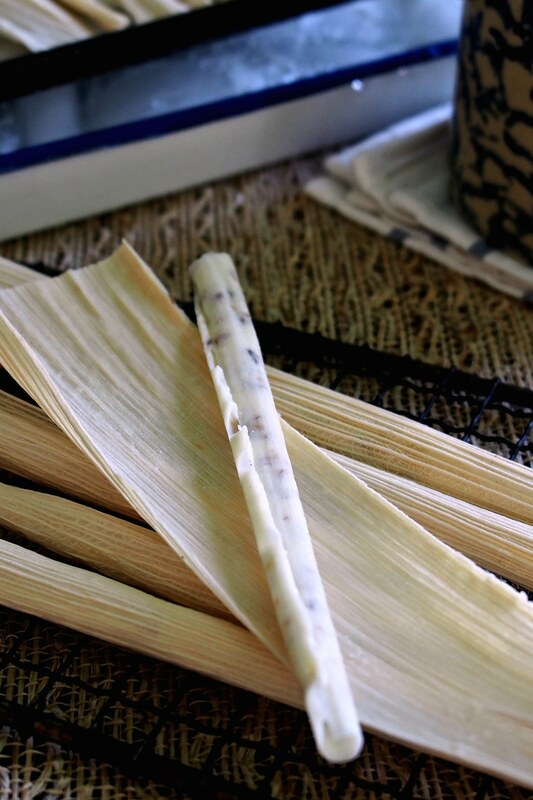 I don’t often fall in love at first sight, but that is exactly what happened when introduced to White Chocolate Tamales. After my first meal at Canyon Cafe, the waiter brought tightly rolled up corn husks to the table. I looked at the waiter – he looked at me then said, “Please, slowly unroll the husks and enjoy.” That is when I fell in love. Not with the waiter, mind you, but with White Chocolate Tamales. I knew I would have to recreate these lovelies at home. These are individual, sweet, perfectly presented confections. Oh yeah, they are also simple to make with only 3 ingredients needed: white chocolate, honey roasted pecans & tamale corn husks. Here we go! Place the husks in a large casserole dish and cover the husks with warm-hot water to soften. Here is a photo of the corn husks I used. I found them in the Mexican food aisle at my local grocery store. 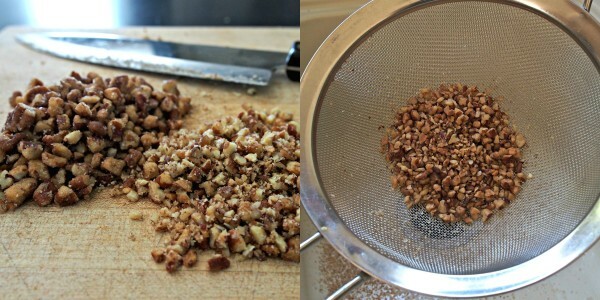 Now – the nuts should be small enough to easily roll into the husks, so mince the pecans pieces. I also shake the minced pecans in a mesh strainer to get rid of excess nut “powder” (See that nut powder in the sink under the strainer in the right photo?) In the left photo below, the nuts on the far left are chopped and the pecans on the right (of the left photo) are minced – that is the size needed. 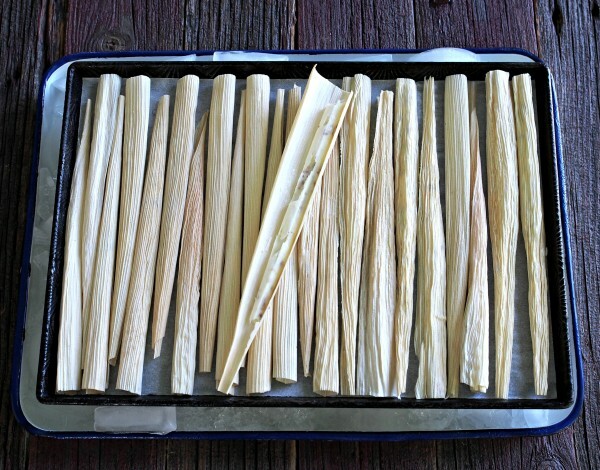 Dry the husks with paper towels, then tear them into 1 1/2 inch-wide strips. Place 3 or 4 in a row then spread the white chocolate mixture down one side. 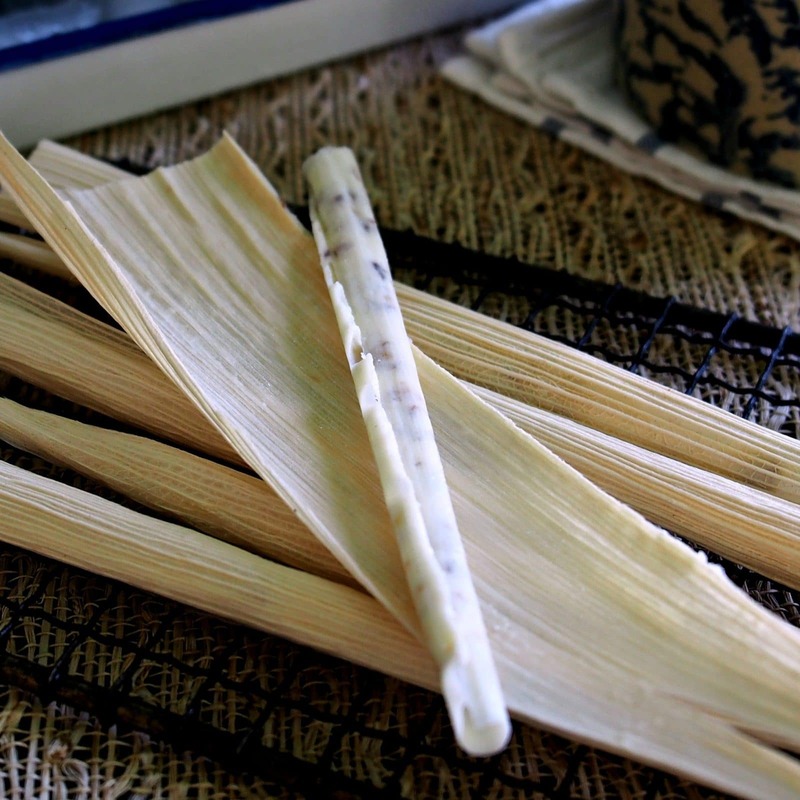 Roll tightly and lay the White Chocolate Tamales, seam down, on a tray to set. 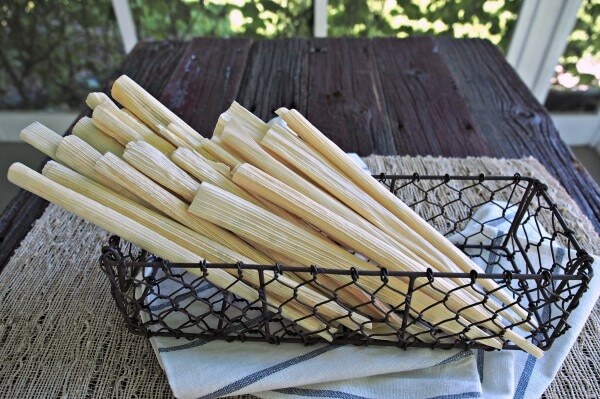 If serving the tamales outdoors in hot weather, set the tray with the white chocolate tamales over a larger tray filled with ice. It will keep them from melting. Voila!! Wrapped & gorgeous, edible gifts. Now, do you get how and why I fell in love at first sight and at first bite? I knew you would. 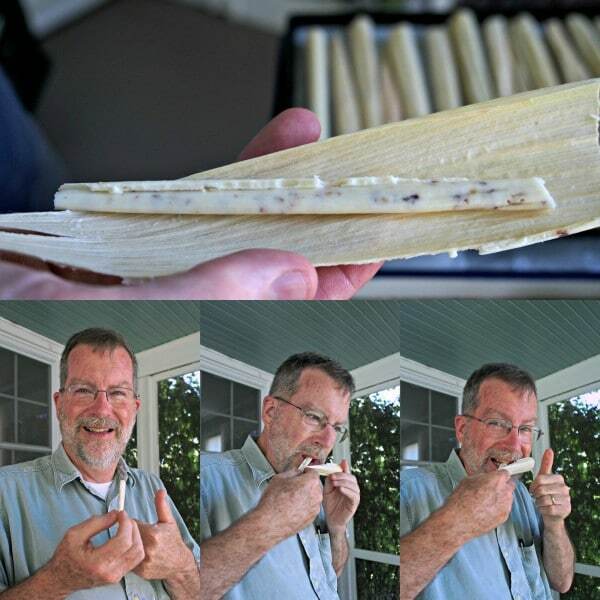 White Chocolate Tamales have become one of Jeff’s favorite desserts. He, too, loves them. 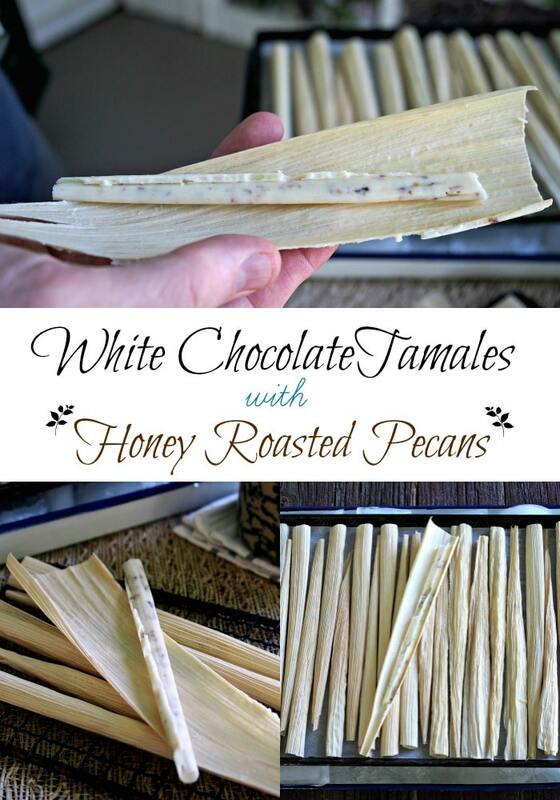 White Chocolate Tamales with Honey Roasted Pecans. 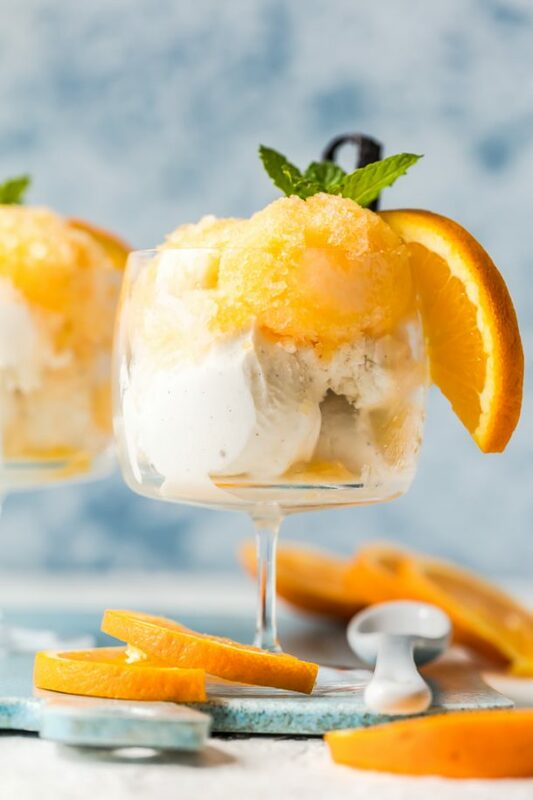 These tasty treats are fun to make and delicious to eat; the perfect sweet ending to any meal. Cover a small cookie sheet with parchment or waxed paper. 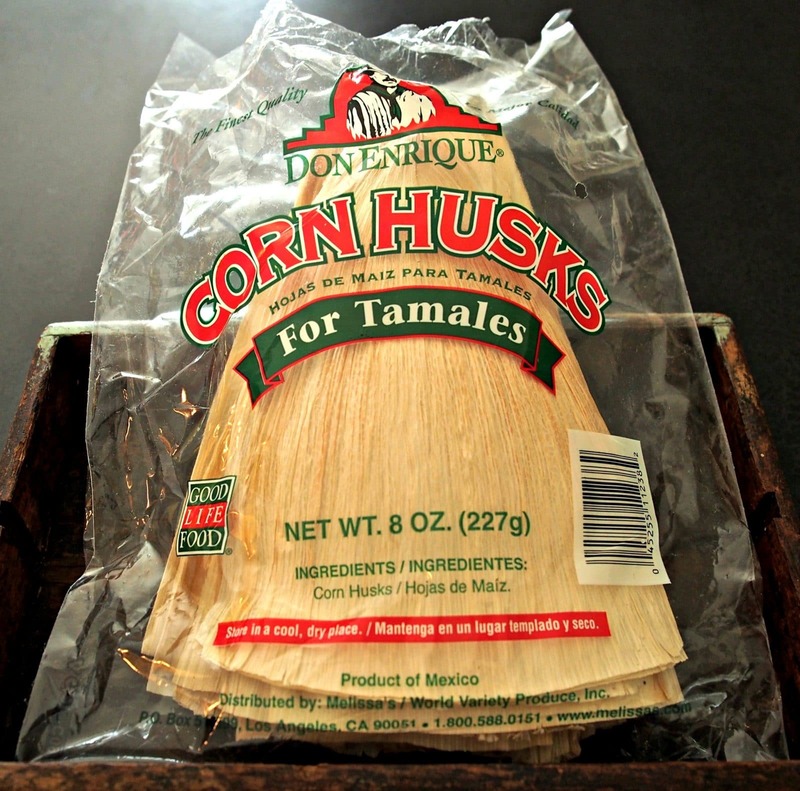 Place corn husks in large casserole dish and cover with medium hot water. Place a smaller container over the husks to keep them submerged. 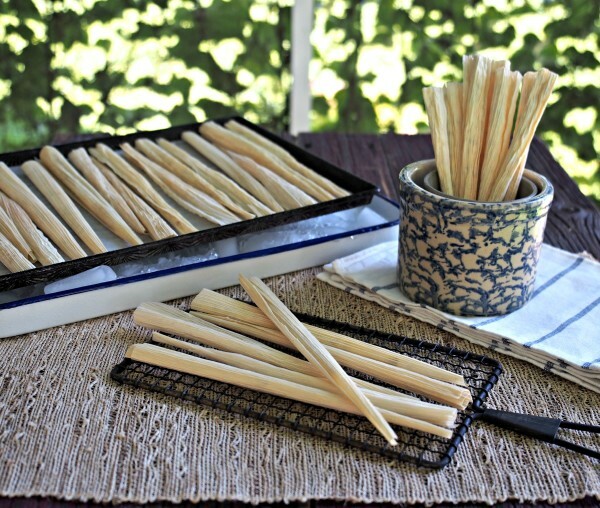 Let the husks soften at least 5 minutes. While husks are softening, melt white chocolate per package directions. Combine melted white chocolate and minced pecans in a medium bowl. Remove softened husks, dry with paper towels and tear them into 1 1/2 inch strips. Spread 2 teaspoons white chocolate/pecan mixture down one side of tamale husk then carefully, and as tightly as possible, roll the husks starting at the side with the chocolate. Wipe off any white chocolate that might seep out of the husk. 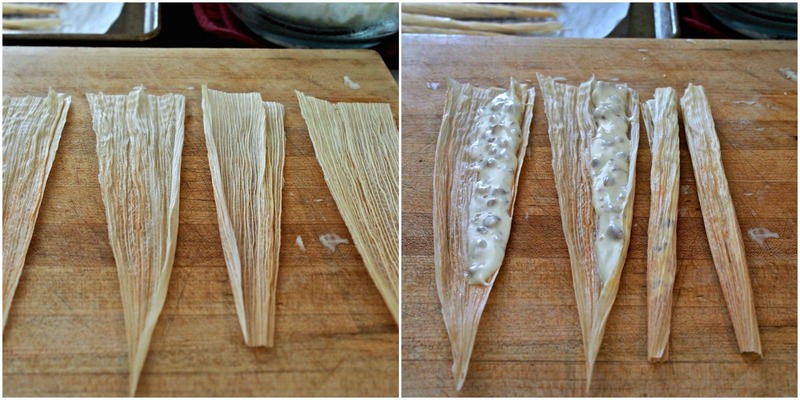 Place the white chocolate tamales, seam-side down, on the parchment covered baking sheet to set. They can be placed in the fridge or freezer to allow to set. Keep in a covered container in a cool, dry location. WOW - very yummy looking and great pics...what a wonderful new idea. I LOVE THESE!!! So awesome, I'm glad you came up with this way to make them at home because they're so addicting! Beautiful pics, dad is such a good sport HA!